On October 3, I went to my second ever baseball game in Japan. Once again, I wasn’t dissappointed. I went to a different stadium with different teams in a different league. 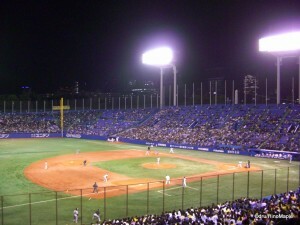 I was watching the Hanshin Tigers face the Yakult Swallows in Jingu Stadium. Rather than take the 40-60 minute ride out to Chiba, I had a nice 10 minute ride and 5 minute walk to the stadium. Jingu is a very nice stadium and I’d say it’s better overall than Chiba Marine Stadium. For one, it’s shape is closer to that of a real baseball stadium. Second, the seats feel closer to the field than Marine Stadium. Marine Stadium is built up to provide a better view. Jingu was built out, but still feels good. The most common way to get to Jingu is to take the Ginza line to Gaienmae and walk up the hill. Before the game, it’s very simple to find the stadium. Take the Jingu Stadium exit and follow the crowds. Yes, it’s that simple. There were many vendors selling everything from burgers and hot dogs to regular drinks and beer. Yes, if you really crave a beer on the walk up to the stadium, you can get it. Boy, I love this country. After a minutes or two, you will see the stadium lights and it’s a fairly easy trip to make. After finding my gate, I ventured up and found my seat and just absorbed the atmosphere. I was sitting relatively behind third base in the visitor’s cheering section. 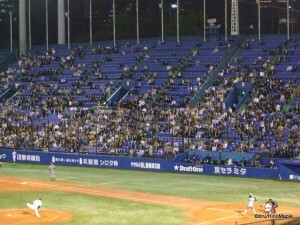 The Hanshin Tigers are very similar to watching the Red Sox or Yankees (I think), so the fans are absolutely crazy. Many came right after work, took off their work shirts and put on their jerseys. 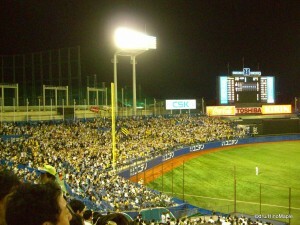 The Hanshin Tigers are one of the most popular teams in Japan. They have an amazing fanbase that goes everywhere they go. They are generally hated by everyone else as they are very vocal. Imagine seeing a Leafs fan in any stadium. They are everywhere. And just like the Leafs, they haven’t won a championship in a long time. In fact, it’s simlar to the Curse of the Bambino in which the Red Sox had an 86 year gap between championship wins. Instead of the Bambino, it’s the Curse of the Colonel. After the 1985 Japan Series, fans took a statue of Colonel Sanders (KFC) and threw him into a canal. Ever since, fans have blamed the Colonel for cursing their team. As for the Yakult Swallows, their history is not as interesting. While they are an old team in the Japan Series, they are not a prominent team. They are akin to the Mets. Second to the Yankees in Tokyo. Tokyo has two baseball teams, and the Tokyo Giants are regarded as the better and more popular of the teams. 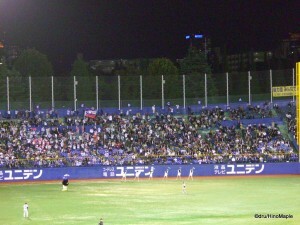 However, like any underdog team, the Swallows also have a small loyal fanbase. Unfortunately, they didn’t have a lot of fans at the game as their team was already eliminated from the playoffs. The game itself started off slow. The first few innings produced no runs, but by the 5th inning, things were exciting. The Tigers were starting to fire themselves up and scored a few runs over a few innings. They were holding a 5 run lead and all the fans were crazy. Every run and big hit made the crowd stand up and cheer like crazy. Before the 7th inning started, the Tiger’s fans did their traditional cheer. Everyone bought long balloons that resemble sperm and prepared to release them. If you have ever watched Anthony Bourdais’ show, don’t forget that you SHOULDN’T TIE the balloon. Everone releases the balloons and they “scream” up into the sky. There is a small plastic grommit fitted at the mouth that creates the sound. After the balloons have finished flying, they sing the Hanshin Fight Song. It’s quite amazing, and I wish I knew the words so I could sing along. Between the top and bottom of the 7th, the Yakult Swallows had the opportunity to do the same thing. Essencially energize their team. However, unlike the Tigers’ and their fight song, they just dance with clear plastic umbrellas. It felt very comical/anime-like, but it was definately fun to watch. The only thing is, you wouldn’t catch me doing it. 🙂 After they did their umbrella dance, something horrible happened. The Swallows took the lead in the 7th. Needless to say, all the Tigers fans went dead silent. I couldn’t believe it. The fans couldn’t believe it. The game had just ended. I thought they would still try to cheer a lot, but unfortunately, everyone was too stunned. Needless to say, the Tigers suffered a surprising loss and it was blamed on the manager. He decided to take a hot pitcher out and tried 3 different pitchers in the 7th. After the game, my thought on Japanese Baseball hasn’t changed. It’s definately more fun than I could ever have expected. The cheering, the beer, the food. The only problem is the washrooms in Jingu. Line-ups that went forever. Oh well. That’s how it should be in any stadium. Again, if you are ever in Japan, and have an opportunity to go to a game, you definately should go. Just learn the cheers when you go and have fun. This entry was posted in Baseball and tagged Bambino, baseball, beer, Boston Red Sox, Chiba Marine Stadium, Colonel, Colonel Harland Sanders, Colonel Sanders, Curse of the Bambino, Curse of the Colonel, fans, Ginza, Hanshin Tigers, Harland Sanders, japan, Japan Baseball, Japan Series, Jingu, Jingu Stadium, Leafs, Marine Stadium, Mets, NY Mets, NY Yankees, osaka, Red Sox, Shibuya, Swallows, Tiger's fight song, Tigers, tokyo, Tokyo Yakult Swallows, Toronto Maple Leafs, umbrella, Yakult Swallows, Yankees by Dru. Bookmark the permalink.